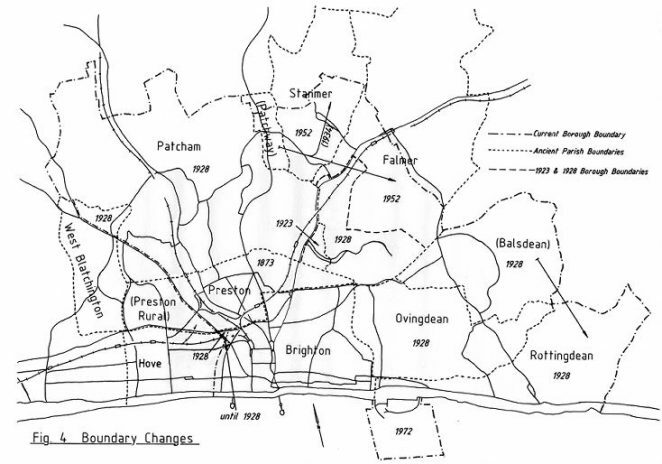 iii) 1 APRIL 1928 (‘1927 Brighton Corporation Act’): The whole of the parishes of Ovingdean and Rottingdean, a large part of Falmer parish (including the rest of the Moulsecoomb estate, the Falmer School area and Bevendean), and those parts of Patcham and West Blatchington parishes to the east of Dyke Road Avenue and Devil’s Dyke Road, were added to the county borough. In addition, a small exchange of land was made with Hove to the north of Seven Dials to simplify the boundary; the new line ran along Goldsmid Road and Dyke Road, such that Goldsmid Road and parts of Addison, Davigdor, Julian and Melville Roads were transferred to Hove while Belmont and parts of Dyke Road and Old Shoreham Road were added to Brighton . ii) Brighton/Preston (to 1928): in the north-eastern pier of the New England Viaduct. 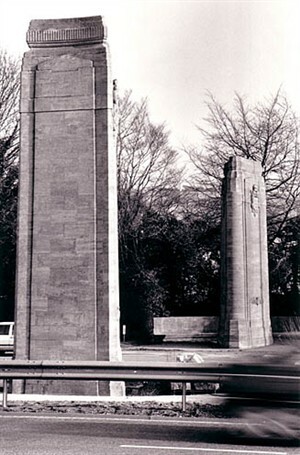 iii) Brighton/Stanmer (1928-52): at Highfields, Coldean. iv) Brighton/Falmer/Preston/Ovingdean (to 1928): at the south-eastern corner of the Race Hill Reservoir in Bear Road. v) Brighton/Ovingdean (to 1928): two between the Race Hill Reservoir and Haybourne Road, and two on the western side of Haybourne Road where there are also a number of Race Ground boundary stones; on the eastern side of Whitehawk Road at Roedean Road. vi) Brighton/Telscombe (from 1928): either side of Marine Drive to the east of Longridge Avenue, Saltdean.